TMA kindergarteners (a.k.a. Kinder Gardeners) discovered that growing your own veggies makes them taste a heck of a lot better. 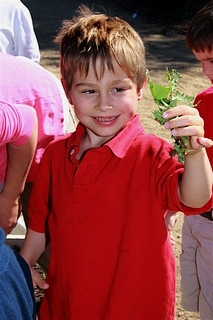 Last week the kids harvested their own lettuce and made it into a yummy salad. Then they replanted yellow chard for their next nutritious recipe. “The kids loved the salad so much I took the rest of the lettuce back to my house and packaged a baggie full for each kid to take home,” says Jennifer Goodwin, parent volunteer. 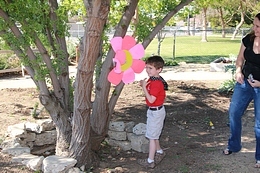 The Kinder Gardeners don’t believe in all work and no play when they’re spending time in the TMA Garden. After the harvesting was done, they played pin the bee on the flower and water relay races to incorporate fun with things that help our garden grow.